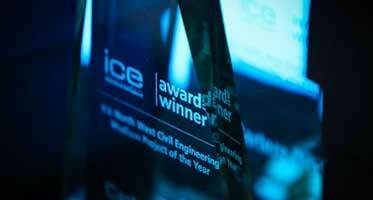 Promoting the success of civil engineers and projects in the North West is important. It helps to raise the profile of civil engineers and the profession across the region. So, tell us who or what has made you proud! ICE North West runs awards and competitions which celebrate achievements and develop the skills of graduate engineers in the region. Find out more about them and how you can get involved. Our ICE North West Civil Engineering Awards celebrate recently completed projects, the region's civil engineering heritage, individual excellence and progressive practices encouraging diversity in the engineering profession. Showcasing the efforts of our members is important and helps recognise their individual expertise and contribution to the profession. Pitch 200 is a competition with a difference. It is an opportunity to show the general public how civil engineers transform their lives. It is also the perfect way to encourage the next generation into the profession. Pitch 200 draws on engineers' creativity to demonstrate a particular aspect of civil engineering to a public audience – with only 200 seconds to do it. Members at every level can submit a presentation, using any props at their disposal to explain a concept in the most engaging way. The regional winner will be shortlisted for the Pitch 200 Final where the overall ICE Ambassador will be awarded. Looking for inspiration? In 2018, Joanna Bateman reached for a bottle of wine to demonstrate how civil engineering helps us enjoy the things we love most and impacts ‘pretty much everything’ to win the North West round. Watch all the final presentations from last year's competition. The ICE North West Pitch 200 is open to all current ICE members who live, work or study in the North West. The closing date for applications is 5 March 2019. Entries will be shortlisted based on your summary. Those proceeding to the next stage will be notified by 8 March 2019. All shortlisted entrants will be invited to make their 200 second presentation at the Pitch 200 regional heat at Leaf, Portland Street Manchester on 26 March 2019, where a panel of judges will choose the winner. The ICE North West Students and Graduates Group runs the region's annual Construction Challenge, in Manchester and Liverpool. The competition allows students to work together, share ideas and win prizes. Teams are challenged build a structure, while dealing with a number of variables such as shifting timescales, to reflect the reality of competitively tendered design and construction processes. Book now to enter a team in the Construction Challenge Liverpool competition on 28 February 2019. 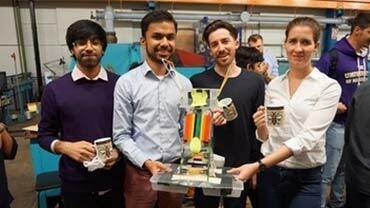 Five teams took part in Construction Challenge Manchester. Following a short presentation to showcase their designs, the structures were then tested in a wave flume. The winning, and cheapest, structure was The Hive. Congratulations to team Buzz Kill: Muhammed Munib - gradute structural engineer, Shuaib Kasenally - graduate civil engineer​, Justyna Paszczak - graduate civil engineer and architect Stuart Pavitt. The Emerging Engineers Award is an opportunity to develop key writing, presentation and debating skills. It's also a great way to boost your continuing professional development (CPD) records. Entrants submit a summary of their chosen paper. Finalists are then chosen to present their paper in front of a live audience. The winning North West entrant will receive a prize of £250 and the chance to be put forward to the national finals. To enter, complete the Emerging Engineer Award entry form, and send your entry to Lauren Moczulski - [email protected] by 23 April 2019. Those shortlisted will be invited to submit a full paper to present for the regional judges to assess at the North West heat on 28 May 2019. The Emerging Engineer North West 2018 winner is Marshel Weerakone for his paper looking at Managing Risk in Newly Discovered Infrastructure.